The dazzling Miss Elizabeth Follett lives in the shadow of murmuring and gossip that inevitably follows every great beauty. A beauty that has haunted her and made her hesitant toward love. Leonard, a charming young Duke, carries the burden of his father’s loss and a title that binds him to a woman he is not in love with. When his steps bring him to Elizabeth, he is determined to never let her go despite his commitment. Their love, scandalous like a forbidden fruit, is in the eye of the storm...a storm made of envy and social outrage that gets Elizabeth kidnapped. With every tick of the clock, her life is more and more uncertain and with it, their happiness together also fades. Leonard craves to save her, but love needs a sacrifice. Leonard, the Duke of Pembroke had barely stopped his horse in front of the manor when cries of excitement rang out to meet his ears. A flurry of activity followed his dismount and Leonard was left beaming at the elated household who came to greet him. He had been gone but a month yet the welcome was the same as if he had been off to the wars and absent for years. The duchy did miss him, regardless of how long or short a journey he had made and regardless of the reasons for his travels. His sister, Catherine, appeared at the threshold while the servants attended to his trunks, her smile matching his own. No one longed for his safe return more than she, of that Leonard was certain. Leonard laughed, a booming, authoritative sound which reverberated through the tree-nestled property. He hurried to greet her. He snatched the riding gloves from his hand and tossed them to a nearby servant boy, along with a coin and a wink. The child’s eyes lit up and he whirled to his mother who stood nearby to show her. Leonard had already moved his attention back to Catherine. He had thought of her endlessly and was eager to hear of how the duchy fared in his absence. He had left so much behind, after all, a small feeling of guilt reminding him of such. I cannot be faulted for going when I did. We all have managed in our own way. Catherine’s face shadowed slightly as she recalled instances but as quickly as it had fallen, the umbra vanished. Leonard was grateful for such small favors. The last thing he wished to do was engage in an argument with her when the occasion was a happy one. “How do you fare? Have you kept Mother well?” The question was not idle. Their household had been through a great deal in the past months and the Duke worried for his family. Thoughts of his mother and sister had weighed heavily on his mind, particularly of his mother. Her proximity to melancholy had been heart-wrenching and Leonard hoped for good news on that front. Leonard accepted her arm and patted her hand reassuringly. Catherine’s mouth formed a fine line and while she made no comment, Leonard had a fair idea what was on her mind. If God was so just, how could He wrench our father from us before his time? Leonard suspected there was more than that troubling his sister, also. She does not understand why I feel the need to travel so excessively when my business is in the duchy. It was a discussion he had shared with not only Catherine but his widowed mother, on several occasions. He did not wish to revisit the issue on that morning. His travels from Wales had been long and he yearned for little more than a bath and a glass of port. “Your Grace, shall I send Jacob to fetch you a bath?” Beatrice asked, well aware of the Duke’s penchant to unwind following a journey. He turned toward the elderly servant and nodded gratefully. “Yes, Your Grace.” Beatrice curtsied before fading into the dim corners of the house. The siblings continued toward the gardens, in search of their mother. Catherine cast him a sidelong look but from where he stood, he could not be certain of what it was meant to express. Relief passed through Leonard at the remarks. The passing of his father a mere six months earlier had not struck his mother well. It was hardly a shock to anyone—his parents had been aptly suited for one another, the respect they shared unparalleled by any wed couple Leonard had known. The 4th Duke of Pembroke’s passing had left quite a hole in the household, his gregarious charm missed dearly throughout the halls of Brookside. Leonard had been equally as haunted by Aylmer Hervey’s passing as the ladies, although he had managed to keep his own anguish much quieter than his kin, as was expected of him. He was the Duke, after all, and it was his duty to remain strong in the face of upset. However, he did not fault his mother in the least for her outward displays of grief. Before he had left on his much-needed journey, he had been tentatively concerned about her wits. A pang of sadness touched Leonard’s chest but he brushed it away. It was the reason he had journeyed to Wales. He had wished to mourn in private and leave it behind before returning to his duties in Pembroke. A splash of brilliant sunlight touched his green eyes as Catherine pushed open the double glass doors leading into the gardens at the rear of the property. Leonard blinked twice, his eyes adjusting to the brightness and Catherine tugged him along eagerly. “A likely story, the sun in your eyes,” Catherine jested and they laughed. Her smile faded slightly, only to remain softly on her lips and she studied her brother intently. He nodded slowly, squeezing her gloved hand gently against the crook of his elbow. “I am not shocked in the least,” Catherine replied, shaking her long, blonde tresses so they fell about the ruffles of her blue dress in a waterfall of curls. Leonard marveled at how much they resembled one another. They were ten years apart in age but much closer than that length of time would suggest. In their youth, they had spent hours frolicking in the tumbling streams near Brookside and hunting in the wooded areas. Despite her fairness and dainty appearance, Catherine was much more a son to the late Duke than she had been a daughter. Perhaps it was the downfall of having an older brother but she was a tomboy, much the chagrin of the Duchess of Pembroke. Lace and bows lay in muddy puddles, marking the wake of Lady Catherine from the time she was old enough to run. Soon, she will be married off to a man of status and he will be caught with his hands as full as an inept juggler. Leonard mused with affection. He admitted to himself that he looked forward to seeing such a union. His sister deserved a strong man. If her future husband could not hold his water then he would not be worthy of Catherine’s affections. Leonard idly realized that he would also have his own woes finding her such a match. That is a matter for another time. I dare not broach the notion of marriage with her today. In my weariness, the idea of such a conversation galls me. His mother’s robust frame came into view as they rounded the wisteria and Catherine called out to rouse her attention. At once, Mary, Duchess of Pembroke, turned her regal head to stare in the direction of the voice. She scrambled to her feet, her long skirts brushing against the loose soil of the garden and she rushed to greet him. Leonard strode toward her, his hand extended to take hers. She beamed at him happily, her aqua-colored eyes bright as she nodded. Leonard chuckled, releasing her hand and falling back alongside his sister. Again, he laughed, grateful to have a family who knew him so well. He doubted very much that he reeked as his mother claimed but it amused him that she teased him. It had been a long while since he had seen her in such a cheerful state. Great ease filled his heart as he saw that perhaps, the worst of their seemingly endless grief might be at its end. “Had I known you would return today, I would have seen that there was quail for supper but I daresay it is quite late in the morning for such a request. I will try, however, I promise nothing,” Mary continued as she studied her son’s face for an indication of his sentiments. Leonard shook his blonde curls, his long hair flapping against the gentle breeze beneath the brim of his high, black hat. Mother and son held a gaze, an unspoken truce falling between them. It was not difficult for Leonard to guess what his mother thought of when he journeyed from the duchy. Before the death of Aylmer, Leonard had found himself in some rather perilous situations. Perhaps he had been inspired by an inherited rebellious streak, one passed from father to son, which encouraged him to engage in often reckless behavior. Leonard had oft made questionable choices which did not permit his mother easy rest at night. That was before Father passed. Now I have my family and the duchy to consider. I would never endanger myself and compound Mother and Catherine’s worries, no matter what temptations may find me. Leonard laughed merrily, grasping Catherine’s arm again. Her children followed the Duchess toward the main house and exchanged glances of amusement. Leonard stopped walking abruptly and stared at her, mildly offended by the insinuation. While he had never been a saint, he had certainly never been a drunk nor a whoremonger. The query was merely another reminder that his sister had been hardened in the absence of their father. Young Catherine would never have spoken such words. Catherine hung her head, shame filling her lovely green eyes, so akin to his own. Leonard knew she did not intend to be cruel but that her own heart was filled with sadness still, despite her efforts to appear aloof. Guilt touched his gut once more and Leonard nodded understandingly. “I see.” He truly did understand his sister’s grievance. She had been left alone in a house with a melancholic mother and servants who could hardly be considered friends. Leonard faced her. Catherine scowled slightly, her bottom lip forming a pout of defiance. Leonard’s eyebrows shot up, shocked by the confession. Catherine brushed by him before he was permitted a chance to speak and Leonard was left alone to gape after her in amazement. Surely she cannot believe that, he thought and as his slow gait took him toward the house once more. Or have I simply been too far removed from the comings and goings of the household? More shame touched him at the thought that his family might be suffering when that was truly the last thing he ever wanted. Leonard entered the estate through the kitchen and nodded to the servants scrambling about, presumably to make his midday meal. “Your bath awaits you, Your Grace,” Beatrice told him softly. Leonard nodded at her. A part of his heart urged him to find his sister and ease the concerns which apparently plagued her but he also realized he knew very little about the matter. I will investigate the rumors which she speaks of, he vowed, although he was quite sure his sister might have exaggerated matters in her own youthful mind. Catherine was more like him than he cared to admit and often times, she would make mountains out of molehills. He wandered from the kitchen, toward the front stairs. It would have been just as simple to use the servant’s steps to his quarters but he had a stop to make before addressing his bath which was undoubtedly cooling with each step he took. He walked through the long hallway and crossed the oak doors of the study to stare ahead. The portrait of his father remained staunchly erected behind the wide desk and Leonard was flooded with a fusion of pride and wistfulness. Eventually, Leonard’s own picture would hang in replacement but he could not bring himself to order them switched, not when it still felt as though Aylmer Hervey lived inside the dark, paneled room. It was not an eerie feeling but one which filled him with comfort. It was a speech he made every day, if he was inside the manor house, secretly certain that the late Duke could hear his proclamations. He missed his father dearly and he hoped that the man had found peace in Heaven above. It had been a long and arduous illness which had claimed him and Leonard knew it pained his family to watch such a powerful man wither away into a shadow of his former self. A gentle rap at the door caused him to turn and Leonard stifled his annoyance. Most everyone in the household knew he should not be disturbed while in his study. He reasoned it must be a matter of importance. “Your Grace, forgive the intrusion,” Jacob, the butler mumbled, his eyes cast downward. He knew better than anyone that he was not to disturb the Duke in his study. “What is it, Jacob?” he demanded again, wishing he would get to the point. He did adore the servants, most of them long-time employees of the duchy but some of them were failing in their advanced ages. Even so, Leonard knew he would miss them when their old age claimed them. He forced himself not to think of such grave matters. The duchy had suffered a great enough loss for the time with Aylmer’s passing. He hoped that he would not be forced to witness another burial in the coming months. Jacob’s mouth twisted into a knot and Leonard instantly tensed. The Duke suspected he knew precisely what had created such a pinched expression on the servant’s face. There was only one person he knew who could instil such immediate disdain among the staff. Miss Priscilla has come calling. “Miss Priscilla is here, is she not?” he sighed knowingly before Jacob could respond. His eyes rose nervously and he nodded quickly. Leonard could read the apology in his eyes although it had little to do with the butler. If Jacob had enlisted an army, they would likely be unable to stop the insistent Priscilla Arquette. Leonard exhaled slowly and steeled himself against the ire racing through his veins. There was little he could do but accept her call. He knew she would not cease until Leonard had granted her an audience. Idly he questioned if the Baron’s daughter had bothered the staff daily, demanding information on his return. It would not have surprised Leonard in the least if she had. Priscilla was nothing if not persistent. If she ever leaves, Leonard added silently to himself. The servant did not respond but he had no doubt Jacob was smiling and Leonard wondered if they had not shared the same thought. Ridding himself of Priscilla was never an easy feat. Jacob scurried away to abide by his wish and Leonard turned swiftly to the crystal decanters. He filled up a glass to the brim, and sipped back the scotch, embracing the burn it created in his gut. He knew he would need all the extra strength he could muster to deal with the impending arrival. If it needed to be through the drink, so be it. Without warning, the younger woman flung herself into his arms and bowled him back into the matte wood of his desk, the shrill tone of her voice reverberating through his tired skull. He managed to sidestep the brazen grip of her arms by a fraction and looked at his butler in shock. Jacob’s face mimicked the disgust he was feeling. How can this woman have such fine breeding and yet her manners are abhorrent? She behaves like a feral cat. Leonard suspected it had much to do with how her father, a baron, spoiled her endlessly. Priscilla was no better than an over-indulged baby, despite her age of nineteen. She was a comely woman but a bore who had nothing of value to add to any conversation. Leonard smiled thinly but he had no doubt that his lack of patience was lost on the Baron’s daughter. He dared not speak the truth in the matter, that he had all but forgotten about her on his travels. It was not a hard feat to accomplish, despite her brash presence. Leonard considered that perhaps his small holiday had been to forsake the memory of Priscilla, also. However short-lived that dream may have been. He cast Jacob a meaningful look, one meant to remind him to boil more water. The butler understood at once, bowed and moved away with more speed than usual. Miss Priscilla does create unease among everyone in her midst, he thought wryly. Even the most seasoned servants long to run from her path. “I have come every day since you left, praying that I will see your face,” she explained, her body too close for his own comfort. He flashed her a wan smile. “Whatever for?” Leonard heard himself ask before he could stop the words but as usual, she did not seem to hear the exasperation in his tone. Leonard wondered if it was done deliberately, ignoring his subtle pleas. He could not fathom that anyone could be so blitheringly oblivious otherwise. He managed to maintain the pleasant expression on his face although his aggravation was only mounting. Leonard did wish Priscilla would say what she had come for and be on her way. Perhaps a month or two? He thought hopefully, knowing well that he would never be free of Priscilla for such a great length of time. For the first time, Priscilla detected the irritation in his tone. Her expression became one of petulance and she stepped back, her blue eyes flashing with annoyance of her own. Again, Leonard shook his head, resisting the urged to seize her by the shoulders and rattle the answer from her. “Miss Priscilla, if you will kindly get to the point? What is it you require from me?” He had forsaken any indication of humor and stared at her balefully, willing the words from her lips. A gust of air escaped her mouth and she frowned. Laughter filled the courtyard and Elizabeth Follett rushed forward to gently push her older sister, Frances again before darting back. She cast her brother, David a secretive glance. She pressed her finger to her lips to caution her younger sibling into silence and waited for Frances to react. “I will find you!” Frances called, her child-like voice filled with determination and glee. Her long arms reached out, the blindfold still covering her eyes as she spun around, seeking her siblings. Once more, Frances spun but caught her ankle-length boot on a stone and stumbled forward. She fell, extending her arms too late to catch herself from tumbling to the grass. Elizabeth and David gasped in unison, one close to tripping upon the other to attend to Frances. “Oh, Franny, are you injured?” Elizabeth cried, worry piercing her heart when she arrived at her older sister’s side. Frances remained on the ground, unmoving but when Elizabeth removed the blindfold, she saw the girl’s eyes staring vacantly into the blue of the sky above. Nothing appeared hurt but her very fragile ego. “I do not like this game,” Frances grumbled and Elizabeth exhaled with relief. David shook his head in solidarity and assisted his oldest sister to her feet. Frances reluctantly accepted his arm but the pout did not leave her face. The younger siblings exchanged a worried glance when Frances did not smile. Thinking quickly, Elizabeth attempted another way to earn a beam from her. David looked pensive and nodded his head in a serious fashion. As Elizabeth suspected, a twinkle of interest glimmered in Frances’ hazel eyes. Her foul mood dissipating, Frances squealed with delight and danced forward through the field not unlike the bantling she appeared to be. David cast Elizabeth a sidelong look as their sister skipped away, and sighed deeply. “I do worry about her,” he muttered. The words only echoed Elizabeth’s own thoughts. It was one that both the Follett siblings shared often, their concern for Frances only growing as the young woman matured in body but not in mind. Elizabeth quickly dismissed the gloomy notion and smiled. Elizabeth could think of worse things to be than a high-born but unwed lady. Frances would always have the love of her family, after all. She wanted for nothing and led a comfortable life, even if it did not meet the expectations of some of their peers. Elizabeth did not offer her insights to David on the matter, however. She knew it would only result in an argument from him. The tips of David’s ears tinged pink and Elizabeth stopped in mid-step to gape at him when he did not deny her question. “I do not wish to discuss it!” David protested, his pace increasing to walk away from her. Of course, Elizabeth would have none of it and dashed after him, her voice rising to fill his ears. David whirled to stare at her in shock. His golden-brown eyes were fraught with distress. “Indeed. Would it not be easier to tell your sister which lady has caught your eye?” Elizabeth agreed, an impish grin covering her lovely face. Of course she would never unleash the town’s gossip upon her beloved brother but her curiosity was piqued in David’s silence. David glowered for a moment, the realization he was caught between two evils defeating him. Elizabeth was truly stunned by the revelation, her mouth parted to show her dismay. Elizabeth swallowed the lump formulating in her throat and reluctantly nodded. She had sworn her silence, after all. She could not very well dishonor her vow, especially, not to her brother. She wondered if she was being too hasty to judge, if she should simply be happy for him. Yet she could not help but feel such a match was fated to be doomed. Elizabeth could not help but feel resentful of Lady Chamberlain who surely knew better at her age of six-and-twenty than to seduce a boy as young as David. Indeed, a man dressed in black galloped his horse toward them and Elizabeth felt a stab of inexplicable worry. Nothing good ever came in such a fashion. She turned her head toward the house and noted with relief that Frances had already made her way inside the manor. She did not wish troubling news to reach her sister’s fragile mind. The messenger peered at the young lord, his eyes narrowed. The messenger appeared wary but Elizabeth recognized the unmistakable glint of interest in his eye as he stared at the lovely woman before him. “I am to deliver this to the lord himself…” he drawled slowly. Elizabeth cast her brother a bothered look. The messenger was merely being difficult and she was having none of it. Her chestnut tresses fanned as she spun and she heard the messenger sputter in her wake. “Miss Elizabeth!” he called hastily. Slowly, she turned but not before shooting her brother a triumphant look. “Perhaps I can make an exception in this case,” he muttered and Elizabeth realized he was studying her face closely. His arrogant disposition diminished considerably, an unbridled respect shining in his irises. “I would not want to see your position compromised,” Elizabeth replied haughtily. She held his gaze evenly, her bright amber eyes glowing. A softness which Elizabeth knew well fell over his expression and he extended his hand to deliver the letter. Elizabeth offered him a cold smile and extended a white gloved hand to retrieve the page. She did not await his response and turned back to the house, her brother close at her heels. A blush of embarrassment touched Elizabeth’s cheeks but she did not allow her brother to see it. Elizabeth did not pay mind to his comment, the reminder of her attractiveness unnecessary. From the moment she was birthed, it seemed, Elizabeth had been revered for her surreal beauty. There were few who could boast the radiant, fair complexion of thick cream nor the elegant structure of cheeks and chin which Elizabeth Follett could claim. Her vivid golden eyes, against the flow of cascading hair, shocked the most casual observer. Her father had oft told the tale that Elizabeth had been kissed by angels in the womb, hence her ethereal charms. Elizabeth knew she resembled her mother but she had little doubt whose disposition she shared. I remain unmarried and without a suitor, much to Father’s chagrin. He does not understand that the noblemen bore me with their flattery and idle conversation. Some are more prone to gossip than the busybodies in the town. I cannot envision such a mundane life as wife to such a man. Elizabeth rose her finger to her lips to keep him quiet. She wanted to ensure there were no servants in earshot of them. Whatever news the letter held was not for them to hear. Only matters of importance would be delivered in such a manner and whatever the envelope contained should reach only the eyes of whom it was intended. When she was content they were unobserved, she nodded and gestured for David to follow her into the front salon. David obliged, securing the door, and hurried back to his sister’s side. The dainty scrawl in black ink was simply addressed to Lord Gordon and Household. “I am afraid to know what it is.” Suddenly, David stared at her as if he debated whether to look. Elizabeth returned his gaze curiously. A wry smile formed on Elizabeth’s lips and she reached across to pat her brother’s hand reassuringly. Oft times she forgot how achingly young David was. Relief and embarrassment touched his face and he nodded in agreement. “How? The address is clear—it is for the entire household. I imagine the messenger was merely being surly for sport,” Elizabeth replied, cracking at the wax seal. She recognized it as the insignia of the Fife estate. “Why would the Baron of Fife send a message?” Elizabeth wondered, her interest piqued. She could not quite recall who the Baron of Fife was. The land was quite a distance to the east of Gordon and the Baron was certainly not a common figure in the duchy which they lived. Elizabeth had not noticed she had sunk into a reverie, all but forgetting about the message in her hands. “Of course.” She looked down at the page and slowly, a smile appeared on her face. Elizabeth nodded, handing her younger sibling the page. The door to the salon opened and Frances entered, her eyes wide and curious. David cast her a nervous glance before eyeing Elizabeth imploringly. “Why are you hiding in here?” she demanded, a look of hurt springing into her eyes. France’s eyes brightened and she skipped gleefully in her spot. Elizabeth knew that her sister did not require answers to any of her excited questions. It was merely her way, to speak in rapid succession. Herbert paced the study in his typical, uneasy way, his myopic eyes darting about. He had the air of trapped prey about him, his chubby cheeks puffing as he fluttered about. If Leonard was to consider it with any great thought, he would liken the barrister to a wild turkey. The barrister flushed slightly and nodded as he slowed his mad movements. He offered the Duke a sheepish smile. “Indeed,” he mumbled and forced himself to sit across from Leonard. The younger man shook his long hair in bemusement before returning his attention to the papers Herbert had brought him to sign. It was only commonplace material before him but the nervous Herbert Barlough could not resist behaving as if the papers were matters during wartime. A stray curl fell across Leonard’s broad forehead and he paused to brush it aside. He realized that Herbert stared at him intently and he sighed heavily. Herbert’s eyes shot away from the Duke, embarrassment coloring his face with a stain of pink, visible even beneath his mutton-chops. Leonard sat back and studied him carefully. He could sense that, indeed, something was weighing quite forcefully on the lawyer’s mind and he was curious to know what it was. Leonard had never known the man to be interested in anything but court matters and yet something else appeared to be demanding his attention. Herbert released a gust of air, the breeze touching Leonard despite the distance across the table, leaving the Duke to wonder how long Herbert had been holding his breath. “I am rather looking forward to the wedding,” he mumbled, his embarrassment clear. Leonard’s back tensed at the mention but he willed himself to maintain a half-smile upon his face. It was not the response he had been expecting. Herbert’s color deepened, the rose becoming a tell-tale red of shame and Leonard wondered if the barrister regretted sharing his thoughts. Leonard felt nauseous at the idea of his wedding being a happy occasion for anyone, least of all his most trusted advisor. Herbert will get more joy from it than I will, Leonard thought regretfully but he did not speak the bitter words aloud. He had promised not to jest the man, after all. Startled, the barrister raised his eyes in confusion. He blinked his eyes several times before forming an answer. Leonard was sure he could hear the wheels of his lawyer’s mind turning while he considered the question. He did not add the word “wits” for he feared what he would do should Herbert answer affirmatively. Leonard laughed at the barrister’s candor. “Nor do I.” He grinned dashingly at Herbert who was ready to flee in terror. It was one of the reasons Leonard thought so highly of the man. Guile had no place in his heart and the Duke felt as if he knew few people who could claim the same. How can the man be in a perpetual state of panic? He has been a valued member of the duchy for years and yet he behaves as if his life hangs in the balance. Leonard knew it was merely a matter of Herbert’s insecurities. The lawyer was not an attractive man; one who had been plagued with several mysterious illnesses in his childhood, and suffering which had left him unhealthy in his maturity. He was near-sighted and particularly pudgy but despite all his shortcomings, Herbert was a brilliant barrister. Leonard trusted him implicitly not only with the duchy’s affairs but with his own thoughts. He knew whatever he and Herbert discussed would not leave the barrister’s lips, no matter how questionable he might find it. Leonard was unsure that was true but relief flooded Herbert’s face and suddenly Leonard realized why the conversation had made him so uncomfortable. He thought I was apt to end the engagement and he would be forced to tend to the aftermath of such a scandal. Of course, the thought had entered Leonard’s mind on more than one occasion. Priscilla was bothersome and demanding. She did not respect Leonard’s need to attend duchy matters nor heed his constant hints to be left in peace. Or perhaps she did and simply did not care. In any case, it mattered not. A duke needed to be married and Priscilla was a good a match as any Leonard had found over the years. He was three-and-thirty, far past the point of being particular. If his father had not indulged Leonard’s desire to sow his wild oats, Leonard would have been wed long ago. Alas, I am no longer Marquis. I am The Duke and must act accordingly. Being Duke means making sacrifices which may not please me. Such as marrying Miss Priscilla. Leonard refocused his eyes on the barrister who watched him with a slightly parted mouth. The Duke mistook his questioning look as a demand to hurry matters along. He dipped the nib of the pen into a bottle of ink and continued to address the issues before him but after a moment, he noticed Herbert studied him with keen interest. “It is not your wedding I am eager to attend,” Herbert explained quickly. His ruddy face paled and he shook his head. He trailed off, his eyes growing wider. Herbert was confused by the words coming out of his own mouth. Leonard stared at him, amused but losing his patience with each passing second. The Duke chuckled. He had known the strait-laced solicitor had not been drinking but he could not resist teasing the man. Herbert’s face registered the naked surprise he clearly felt and he shook his head in disbelief. Leonard pursed his lips as he tried to recall such an event on his roster but he could not. It was hardly surprising that no one had mentioned the invitation to him. If his mother and sister intended to go, they would not think to ask him. They would be certain he would refuse as he had so many other affairs in the past. And they would be right to believe so. Days of festivities—how frivolous. Herbert clamped his mouth closed as he realized protesting the virtues of such an attendance was an exercise in futility. In minutes, Leonard had applied his looping signature to the pages before handing them to his lawyer. “No, Your Grace.” Leonard suspected the man had a great deal more on his mind but did not wish to pursue the issue. What would be the point? Leonard had no interest in such trivial matters. The Fife and Curry duchies were quite far removed from Pembroke and he did not oft do business that way. He was not bound to offend anyone with his absence and with a wedding which promised such a crowd, he would not even be missed. Herbert excused himself and Leonard was left alone in the study. Inexplicably, he thought of the wedding Herbert had discussed and was unable to shake from his mind the idea of attending. Their household was oft invited to galas and events but Leonard rarely joined in the festivities. If he were to attend a party, it was when he traveled to distant lands and he knew no one. To Leonard’s mind, there was little enjoyment in the same dull noblemen and vapid women he had known all his life. It was difficult to enjoy oneself with wagging tongues and scrutinized looks enveloping him at every turn. Yet, perhaps it was because his own union was nigh, Leonard found himself considering Lord Curry’s wedding. He turned toward the portrait of his father. Leonard did not answer her question but instead posed one of his own. His sister blinked at the abrupt conversation change but immediately nodded. The words surprised him as much as they did Catherine. She eyed him warily. Leonard gave her a charming smile but he could feel a slow blush forming under the collar of his starched shirt. “Mind your tongue!” Leonard said sharply but his tone lacked sincere anger. His sister’s dislike for his fiancée was hardly a secret. Priscilla herself was aware of Catherine’s deep disdain for her. “Catherine! You are perilously close to arousing my anger,” he warned but again, he disbelieved his own words. It was difficult to feel anything but indifference toward Priscilla when he knew the match between them had been born from convenience. Even so, his keen sense of chivalry did not allow for Catherine to speak so brazenly and awfully about her. His sister made a clucking noise with her tongue and sat at the desk, her eyes shadowed. Catherine raised her gaze back to him, the confusion on her cheeks clear. Leonard did not fault her perplexed expression. He was not certain he, too, understood his own actions. “I will see that the servants have you prepared for travel,” she replied slowly. Leonard could see she wished to say much more but to his relief, she did not pursue it. He did not wish to be questioned when he did not have valid answers for her. Leonard smirked slightly at the naïve question. A hopeful expression touched Catherine’s face. Clearly she had expected a rejection. A small jolt of guilt pricked the Duke and he realized again how little time he had spent with Catherine following the death of his father. The least he could do was allot a few hours to accompany her. Has the town changed or have I? Leonard mused silently. With Catherine’s arm in his, they moved about the streets but all appeared much smaller than the last time he had visited. His sister chattered in his ear as they walked but Leonard admitted to himself that he heard very little of what was being said. He gazed about, nodding at passersby who oft paused to stop and bid them good day. Catherine did not seem to possess any signs of the insecurity she had claimed upon his return home but he wondered if it was his presence which inspired the confidence she felt. “There are no highwaymen in the town,” she grumbled although she knew it was merely Leonard’s excuse for avoiding the shop. Catherine sighed heavily but turned to enter the shop. “You are an awful shopping companion,” she muttered as the door closed at her back. “You may thank me at another moment!” Leonard called jestingly after her. Catherine did not turn around. The Duke smiled to himself and leaned casually against the wall. He reached for his pocket watch and noted the time. The shops will be closing soon. I must return to Brookside and tend to the last of my duties if I wish to attend this wedding. He found himself questioning his reasons again. It was absurd for him to be struck by an urge to go based solely on Herbert’s excitement on the matter. The attorney was much like a young boy in some ways, despite his high mind. Leonard wondered if he had not simply been caught up in Herbert’s infectious glee for the occasion. As he replaced the gold watch in his waistcoat, a breeze of air diverted his attention upward. A few steps beyond where he stood, two young ladies were walking, their fine dress depicting noble breeding yet Leonard did not know them on sight. She sounded as though was singing as she spoke but without a childish undertone. Her voice was simply musical without attempting to be so. Leonard pushed himself off the building and stared after them but all he could see was the tendrils of their dark tresses against the velvet backs of their gowns. They walked in slow, measured steps and Leonard was consumed with the urge to match strides with them. A few yards behind, a housemaid trailed after them. “We will find you another to your liking,” the first girl replied softly and Leonard was touched by the patience she exuded, despite her companion’s near-caterwauling. Their voices faded away as they turned a corner and Leonard stared after them for a time. They had not looked familiar in the least but Leonard could not still the notion that he had known the honey-voiced girl. ​Or perhaps that was wishful thinking. Momentarily, Leonard considered he was taking leave of his wits, first with his desire to attend the wedding and then with him staring after a faceless woman. “Are you well?” Catherine asked. She had appeared unexpectedly at his side and her words caused him to jump. He had been entranced by the sight of the girl. There was a newfound urgency in him and he hurried his sister back to their coach. If the woman he had glimpsed was a noble, she would likely be at the wedding in Fife and suddenly Leonard knew there was no place else he wished to be more, if only to catch one look of her face. 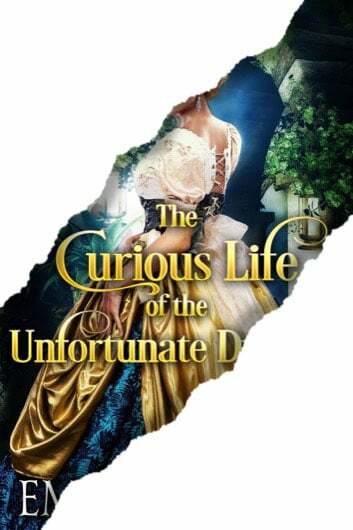 The Curious Life of the Unfortunate Duchess is live on Amazon now! I really liked what I read so far in the preview, and I’m looking forward to reading the whole book. Your patience shall be rewarded, darling! ❤️😍 Thanks a lot! I very much like this story. The family that has a disabled sister who so lovingly care for her will be interesting to see how this very real family existed in the recency time. The marriage expectations will be entertaining too! I look forward to reading the whole story! Sounds so good. I am so excited. Already caught my interest, look forward to reading the book, I it’s entirety. This story sounds very interesting and a must read. I am not sure how the title fits in though? I enjoyed reading the preview. Look forward to finishing the book!! I am looking forward to getting this book so I can have it read to me. It sounds very interesting and can hardly wait to see how it all turns out. The pacing of this book flows gently. The author gives detailed descriptions of both main characters prior to their initial meeting leaving the reader to anticipate what will happen when they finally meet. It is a great beginning and I look forward to finishing the book once it is released. Keep up the good work, Emma! I really enjoy your writing style and that your books are clean, romance books. Thank you for the advance preview. Thank you so much for your support, dear!! I appreciate it beyond words! ❤️❤️ It’s always my pleasure… Stay tuned! I lover the book already and can”t wait too read the book. An interesting start to the story, does Leonard find true love at the wedding. It seems his fiance does not fit into the picture at all. perhaps both Leonard and Catherine will find their future at the wedding. I’m looking forward to seeing how this ends, my imagination has already taking it off and running. What I read so far shows the duke has doubts about his coming marriage. Can’t wait to see how it all works out. Good teaser. I was hooked by the end of Chapter 2. I can’t barely wait for Sept. 6th. Looks like a great read! I can’t wait to read it. It’s interesting. Yes, I like this preview and I am very, very interested to read the book.The plot is a little unusual and from my point of view this is super ok. So I hope the rest of the book is as original as the preview. Best wishes. Loved it, and cannot wait to read the book in it’s entirety. I can not wait to read the rest of the story!!! I loved the characters at first read, can’t wait to finish their story! Please hurry with more! I really enjoyed what I have read so far. Looking for ward to the rest of the book. It certainly sparks the interest. If the storyline of the book continues as well as the first three chapters, it should do very well. Yes ,I like the preview very much. Can’t wait to read the rest of the book. This is another well-thought out story of love and all its problems! I loved the characters, and, yes I cannot wait to read the ending!!!! You’re so kind, darling! Thanks a lot ❤️ It’s on its way!! Can be said in few words…..I loved it!!!!! The first chapters have the beginnings of a wonderful story. Excited for September 6th !